Note from Editor: This is a followup to our 2007 article on Building a Glitterhouse. We really do recommend that you start with that project, as that description is step-by-step. These projects come to us courtesy of Floriday designer Howard Lamey. 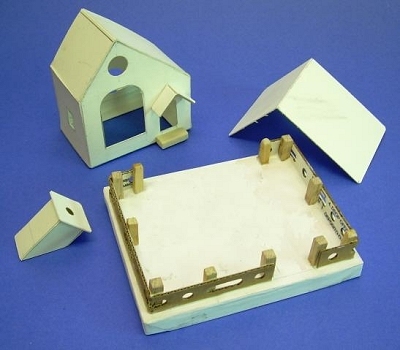 Howard loves collecting and designing replicas of those little cardboard houses that became popular Christmas decorations between World Wars. 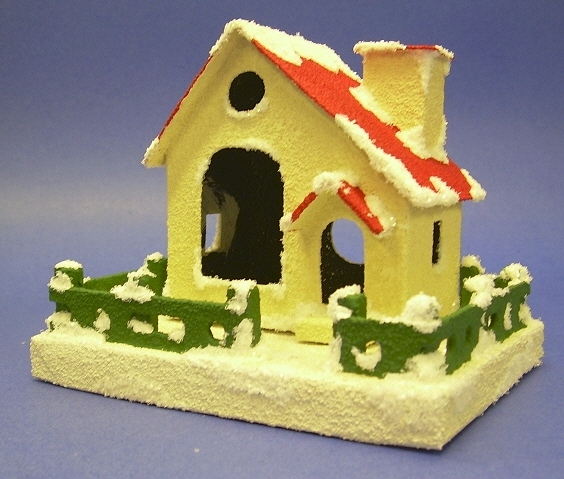 Collectors call the "putz" houses, from a German-American word related to "putter." 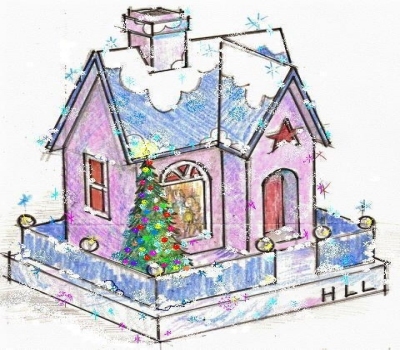 Howard calls his creations "glitterhouses," because that's the specific kind of putz houses he likes the best. 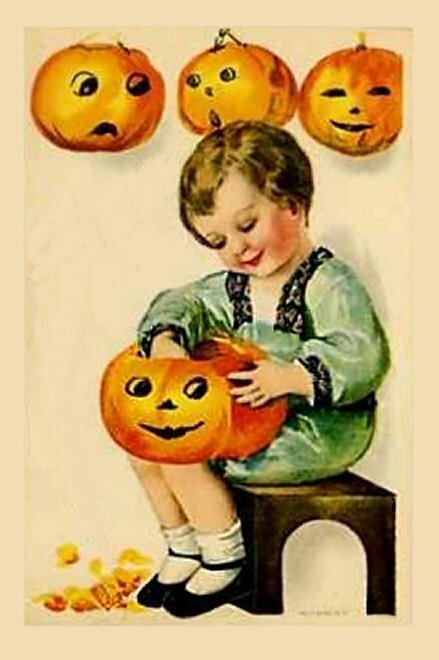 Update for 2009 - Halloween Graphics added! 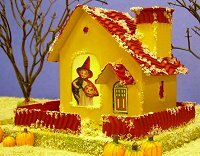 If you have started your own Halloween village, you'll be glad to see that it's easy to make a Halloween version of this by making some very minor changes and using Halloween-themed graphics like the ones we've provided. For more information on this option, simply scroll down the page. 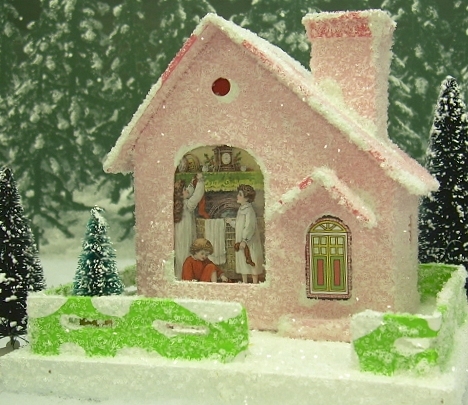 One of the relatively rare kinds of "putz" (Christmas cardboard village) houses was the "Picture Window House." 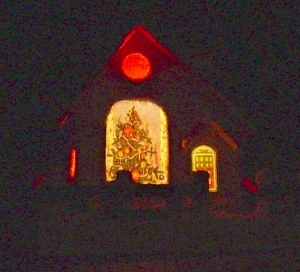 This structure included a large front "window," that displayed a Christmas scene of some sort. The main differences between this project and the starter project are the picture window and that we have added a textured finish using sand. 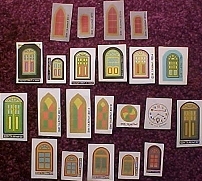 Colored celophane or translucent plastic for the other windows and the door. The paper door I used is available from www.papatedsplace.com. Ted Althoff has a full line of reproduction doors plus red “cellophane type” and paper windows. 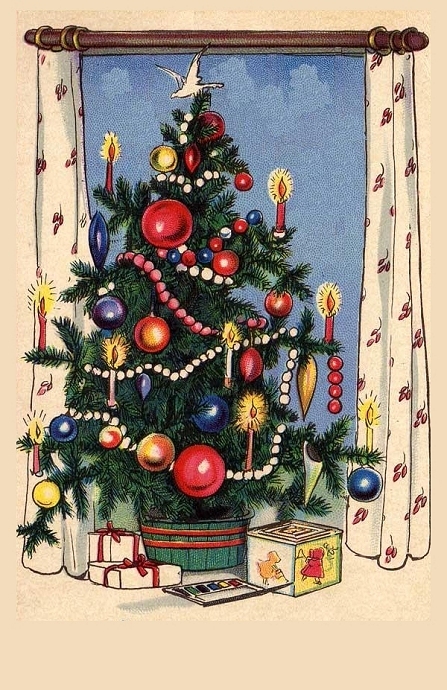 Other accessories, such as bottle brush trees, that you plan to use to finish the house. Note: Our article on What You Need to Build Glitterhouses lists many other materials and tools that will help you work more quickly and effectively. Select the print option, tell it to "auto rotate and center" or whatever else you need to make it go to Landscape mode. Don't select the "scale to page" or "shrink to fit" option. Print. Note: On most printers, a small portion of the first image will disappear at the outside edge of the page. But you can easily "fill in the details" by looking at the jpg version - if you allow your printer to reduce the size of the drawing to fit the "printable" page, your plans will be about 5% too small. If you don't have Adobe Acrobat Reader on your computer or for some reason that doesn't work, you can open the big JPG versions by clicking on the reduced plans above. Choose the "file, page setup" from your browser. When the page setup menu comes up, select "landscape mode." Choose the "scale to fit" option (sometimes "print as large as possible" or something like that. You may have to tweak the sizes a little to get them just right, though - that's why the PDF versions are more likely to work for you. The base is a rectangular "box" that is decorated before the house and trees are installed. For this project, it should be about 4" x 5" and about 1/2" high. Cut the Base and Fence - For this project, I cut the base and fence out at the same time. 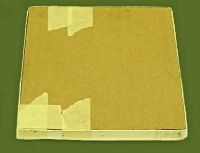 The base is made from heavy corrugated cardbard, the kind they use in big boxes. The fence pieces are made from fine corrugated stock, like that from the small express mail boxes you get at the post office. The same kind of fence can also be cut from heavy card stock such as back of a writing tablet. If you wish, you may use different materials for the fence, such as a miniature wooden snow fence from the craft store or a rustic rail fence you make from twigs. To cut the inside part of the fence, use a hole punch as shown in the plans. Then use a straightedge and Xacto knife to connect some of the holes to get the open oval shapes. 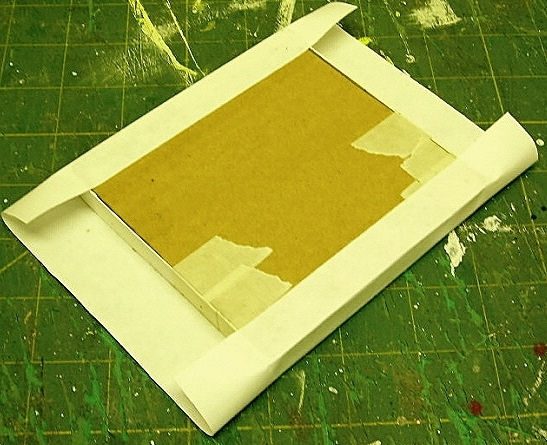 Glue The Base - Build the base up from layers of corrugated cardboard glued together in a sandwich. 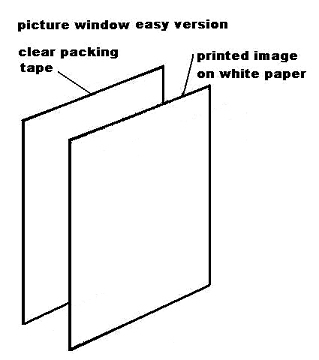 You then wrap and glue a strip of thin poster-board or cereal-box cardboard all around it to smooth over the rough edges of the corrugated cardboard. Wrap the Base - When the base is built and the glue is dry, you cover it with white bond paper just like you would wrap a gift, except that all surfaces of the paper cover must be completely glued down to the box. A glue stick works great for this. Prime the Base and Fence - When all the glue has dried, paint the base with the flat white paint. This provides an even finish that will hold the acrylic paint and glitter. If the fence has cardboard in it, prime it, too. Score the fold lines before you begin cutting out the parts (although you may score the roof pieces later, if you wish, after you've checked the overhang). Use the metal ruler or other steel edge as a guide. Note: You'll notice that there is some "hurry up and wait" involved with this portion of the project. That's one reason I often work on more than one building at a time. 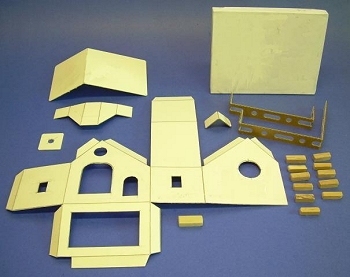 Using Elmer's white Glue-All or a similar product, assemble the house pieces. White glue works best if you apply a thin coat to each mating surface and wait a few moments for the glue to become tacky. Do not glue the house to the base yet. Glue the chimney and chimney cap together. When the glue is dry and you feel that the structure is "sound," double-check the roof size. 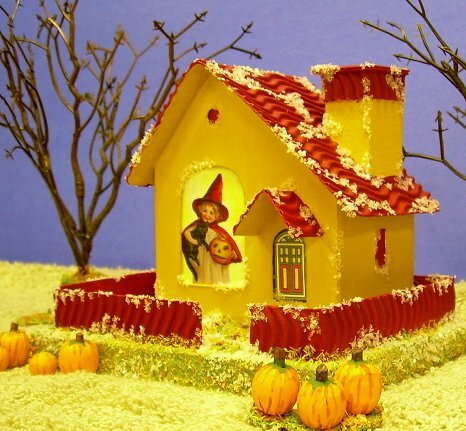 The most important thing is that it has an overhang on all sides just like a real house. After you determine where the peak of the roof should be, score the crease. Make any adjustments to the outside shape of the roof as necessary, and glue on the roof. When the glue for the roof is dry, glue on the chimney. Prime the house, including trim, with flat white wall paint. 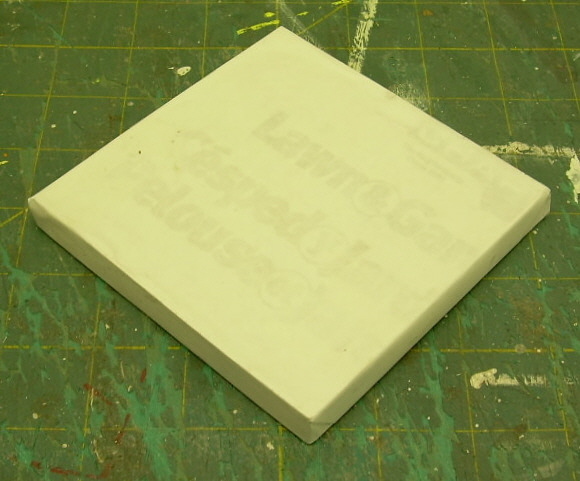 Don’t skip this step; it gives you a uniform surface for painting. As the primer is drying, get your sand ready to apply - you might consider using a salt-shaker. After the primer is very dry (such as overnight), make a small batch of a 50/50 paint in the color you've chose and Elmer's white glue. Working on only one surface at a time, brush the glue/paint mixture on, then sprinkle sand on it before the mixture starts to film over. 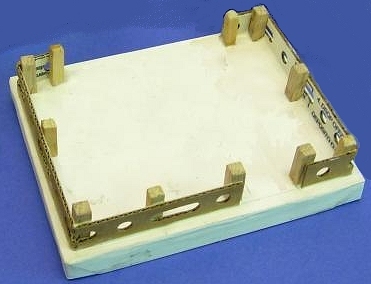 If an area isn't covered evenly, touch it up with straight glue and more sand, and let THAT dry. Paint the house in your choice of colors. Don't glue the house to the base yet, though. 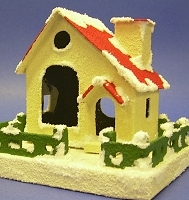 Paint white patches for "snow" on the roof and chimney. The photo to the right gives some ideas for varying the "snow" pattern on a series of houses. Once you get good at this, you could combine this step and the next by using a 50/50 mixture of white paint and Elmer's glue, then sprinkling on the glitter before the paint/glue mixture starts to dry. At first you may want to do this in two separate steps, though. If you haven't already put glitter on the "snow," add it now. Brush on a thin, but even coat of undiluted white glue over a white patch on the building and sprinkle on the clear glitter. Don’t try to do the entire house or base at once. 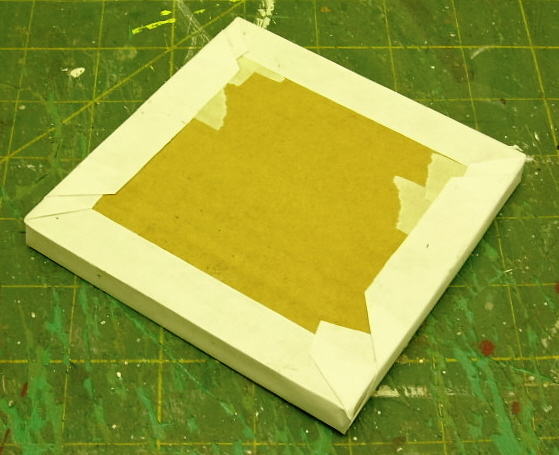 White glue starts to film over and dry quickly so just do a section at a time. The glue dries clear, so don’t judge the final look until the glue is dry. Decide on and print a graphic the size you need it. 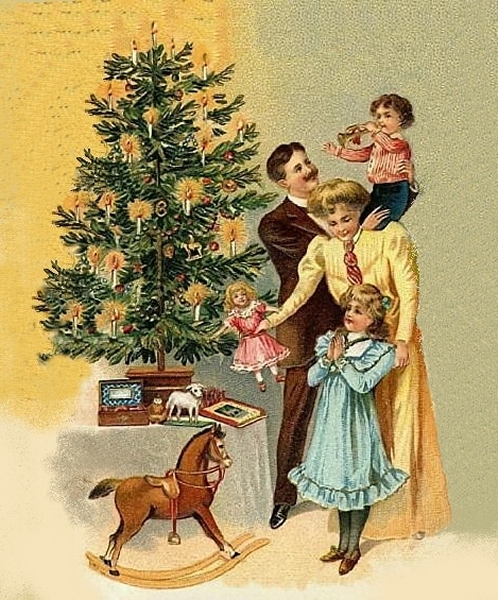 We've put a few here, but you can get more by scanning old Christmas cards or "googling" Christmas images on the Internet. 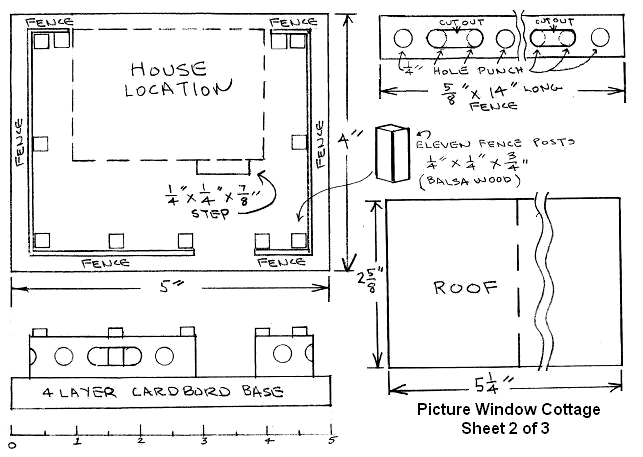 For your convenience, we've provided a .pdf version of each that is prescaled to go with the building plans on this page. We've also provided a .jpg version that you can resize if you need it in another scale. When you have your graphic ready to install, build the "picture window" as shown below. I've used two basic approaches. Good - There are two ways to do this. 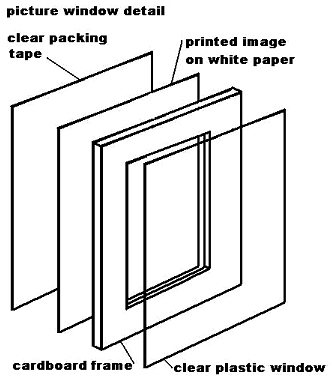 The easiest is to find a graphic you like, print it the right size on your color printer, stick it onto a piece of clear packing tape, and glue it into place inside the building. Better - If you have access to clear, thin plastic or some similar material that you can use as a "windowpane," consider making a "sandwich" picture window. This version provides more sense of depth, and the clear plastic "windowpane" protects your graphic. Try your picture window out for "placement" before you apply glue. 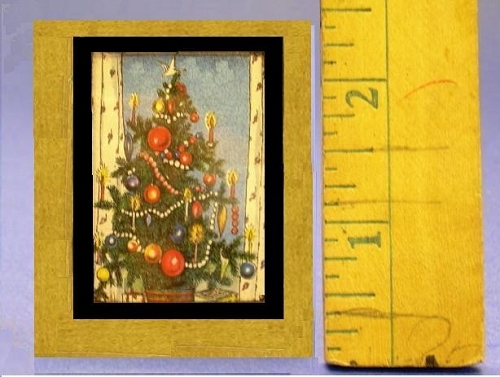 Once you're satisfied with the optimum placement, draw a guide line on the inside of the house, and glue the picture window in place with white glue. You'll only have a few seconds before the glue starts to set up, so be certain it's where you want it, then hold onto it for a minute or two to be certain it's going to stick before you set it down - you don't want it to slide down and wind up glued in the wrong position. The paper door I used is available from www.papatedsplace.com He has a full line of reproduction doors plus red “cellophane type” and paper windows. Ted’s site is the only place I know of for these, all of which are exact copies of vintage ones. Glue the other window and door covering material on the inside of the house. I use colored velum or colored “cellophane type” material. Red seems to be the traditional color but you can use any color you like. Glue the finished house to the finished base. 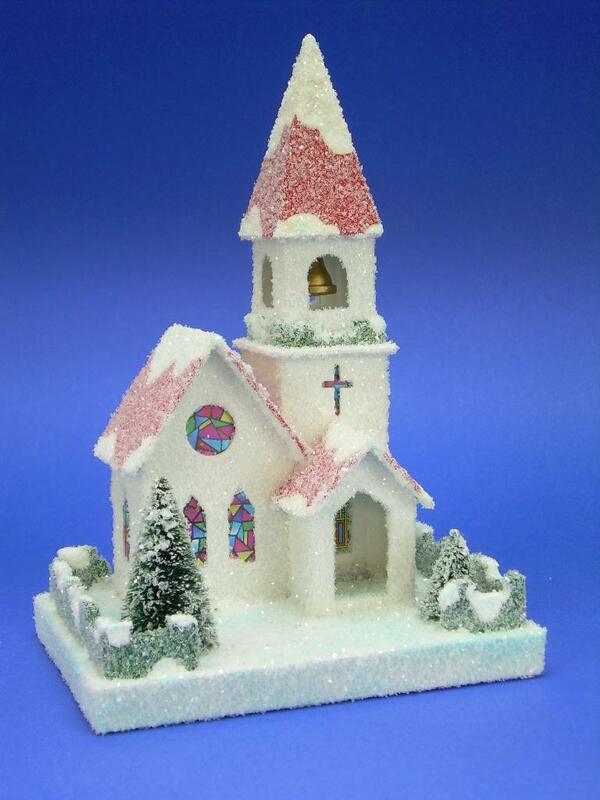 Fill in any gaps between the house and the base with white glue and sprinkle on more glitter. Add yard accessories such as bottle-brush trees, as desired. When everything is glued together and the glue has dried, touch up any place that the glitter hasn't covered evenly. If you wish, you can use several light coats of clear satin acrylic spray to protect the paint, glitter, sand, and graphic from handling and light. Here's an example that shows just how flexible these designs are. The version to the right doesn't use the sand finish, uses sawdust instead of glitter on the base, and it uses a different kind of cardboard for the roof (taken from a Starbuck's-style coffee cup). 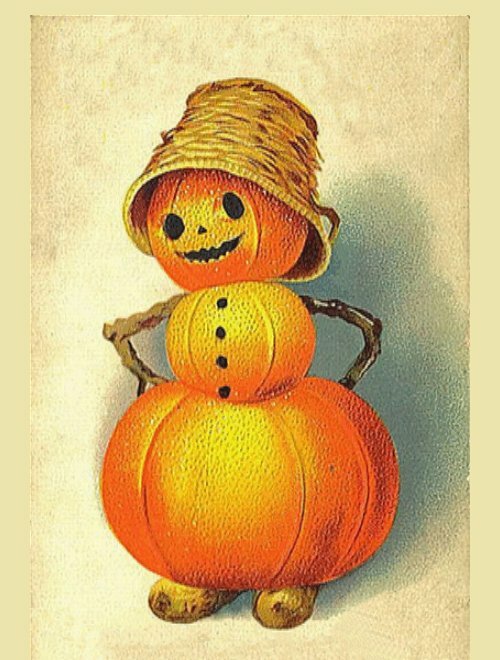 You can see that by using colors suitable for Halloween and substituting a Halloween-themed graphic in the "picture window," you can have a nice Halloween-themed structure. Commercial "Plug" - Now that I'm in "retirement," this hobby has become a sort of avocation for me. Several folks have commissioned me to build specific houses for them. I often provide an "artist's conception" such as the one at the right to make certain I understand what they want. Sometimes the "artist's conception" needs to be tempered by adjustments to make the house fit in better with the other houses it will be joining, as well as color and accessory changes. But it all starts, quite literally, at the drawing board. Perhaps you had a pasteboard house collection when you were young and would like to have a replica made. Or you have an idea for somthing that's never been done. If you can find a photo or hash out a drawing or anything else to give me some idea of what you're looking for, that can be enough to get started. 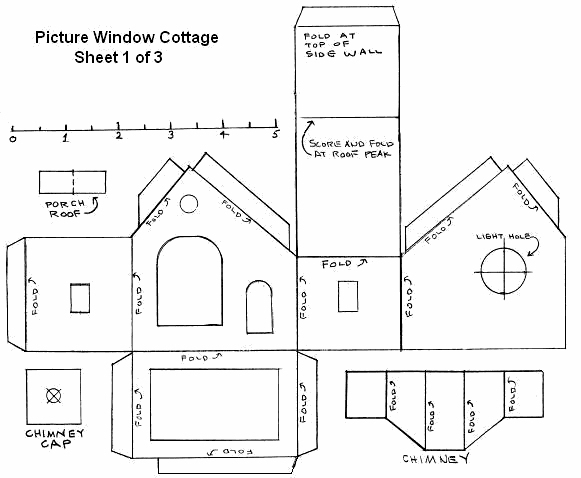 If you'd like me to help you design and/or build a special vintage pasteboard house for you, or if you have any questions at all, please see my site, LittleGlitterHouses.com for more information. Looking for Your Ideas, Projects, or Photos - Also, if you have similar project, ideas, or photos that you'd like to share with your fellow readers and hobbyists, we'd love to add them to our sites, and we'll be sure to give you full credit for your contribution. 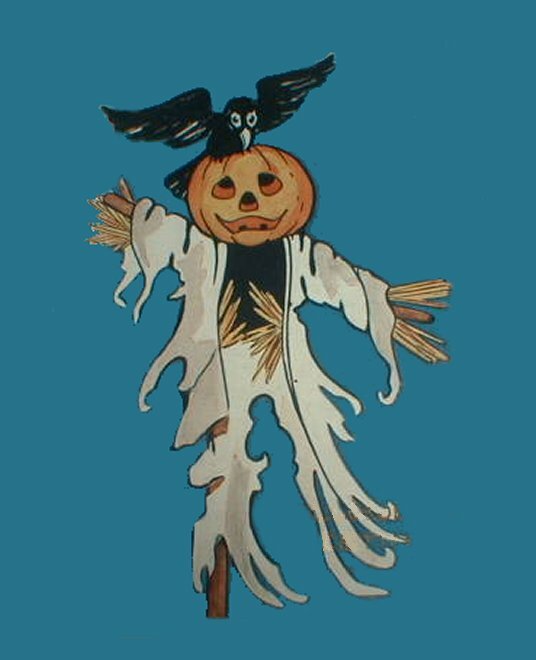 Welcome to Spook Hill™ - Howard has designed a whole, family-friendly, Halloween community built in the vintage "putz-house" style. Includes many free downloadable plans, photos, and detailed instructions. Note: LittleGlitterHouses.com(tm) and Spook Hill(tm) are trademarks of Howard Lamey. Big Indoor Trains(tm), Big Train Store(tm), Family Garden Trains(tm), Big Christmas Trains(tm), Garden Train Store(tm), and Trains and Towns(tm) are trademarks of Breakthrough Communications (www.btcomm.com). 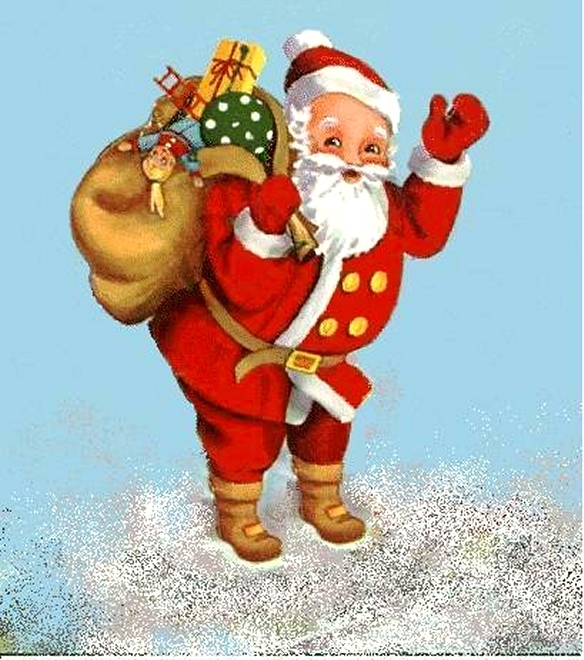 All information, data, text, and illustrations on this web site are Copyright (c) by Paul D. Race. Reuse or republication without prior written permission is specifically forbidden.